Small volumes of anti-PRKCA antibody vial(s) may occasionally become entrapped in the seal of the product vial during shipment and storage. If necessary, briefly centrifuge the vial on a tabletop centrifuge to dislodge any liquid in the container`s cap. Certain products may require to ship with dry ice and additional dry ice fee may apply. Activation of protein kinase C (PKC) is one of the earliest events in a cascade that controls a variety of cellular responses, including secretion, gene expression, proliferation, and muscle contraction (1,2). PKC isoforms belong to three groups based on calcium dependency and activators. Classical PKCs are calcium-dependent via their C2 domains and are activated by phosphatidylserine (PS), diacylglycerol (DAG), and phorbol esters (TPA, PMA) through their cysteine-rich C1 domains. Both novel and atypical PKCs are calcium-independent, but only novel PKCs are activated by PS, DAG, and phorbol esters (3-5). Members of these three PKC groups contain a pseudo-substrate or autoinhibitory domain that binds to substrate-binding sites in the catalytic domain to prevent activation in the absence of cofactors or activators. Control of PKC activity is regulated through three distinct phosphorylation events. Phosphorylation at Thr500 in the activation loop, the autophosphorylation site at Thr641, and at carboxy-terminal hydrophobic site Ser660 occurs in vivo (2). Atypical PKC isoforms lack hydrophobic region phosphorylation, which correlates with the presence of glutamic acid rather than the serine or threonine residues found in more typical PKC isoforms. Either the enzyme PDK1 or a close relative is responsible for PKC activation. A recent addition to the PKC superfamily is PKC u (PKD), which is regulated by DAG and TPA through its C1 domain. PKD is distinguished by the presence of a PH domain and by its unique substrate recognition and Golgi localization (6). PKC-related kinases (PRK) lack the C1 domain and do not respond to DAG or phorbol esters. Phosphatidylinositol lipids activate PRKs and small Rho-family GTPases bind to the homology region 1 (HR1) to regulate PRK kinase activity (7). 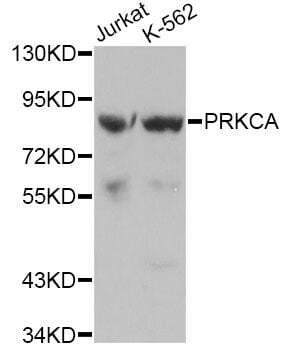 Western blot analysis of extracts of various cell lines, using PRKCA antibody. 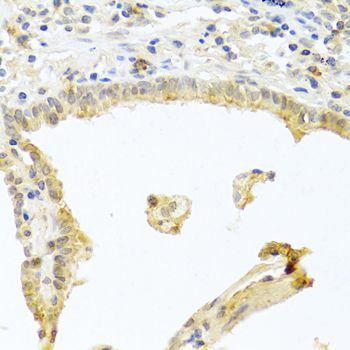 Immunohistochemistry of paraffin-embedded human lung cancer using PRKCA antibody at dilution of 1:100 (40x lens). 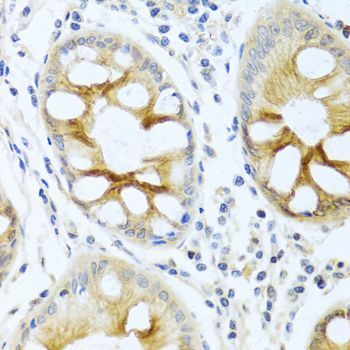 Immunohistochemistry of paraffin-embedded human colon using PRKCA antibody at dilution of 1:100 (40x lens). Immunofluorescence analysis of U2OS cells using PRKCA antibody. Blue: DAPI for nuclear staining. NCBI/Uniprot data below describe general gene information for PRKCA. It may not necessarily be applicable to this product. PKCA: an AGC kinase of the PKC family. A classical PKC downstream of many mitogenic and receptors. Classical PKCs are calcium-dependent enzymes that are activated by phosphatidylserine, diacylglycerol and phorbol esters. Contains a pseudo-substrate autoinhibitory domain that binds to the catalytic domain preventing its activation in the absence of cofactors or activators. 1. PRKCA polymorphism changes the neural basis of episodic remembering in healthy individuals.